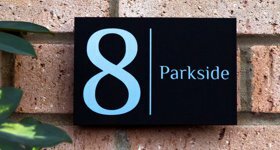 The Vasari: A modern and stylish alternative to slate house signs featuring clean edges and a beautiful matt finish. 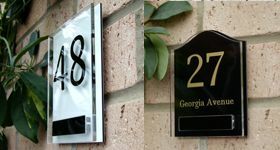 The size range makes it suitable for single numbers to large house name plaques. 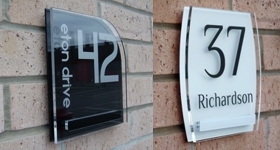 The Marletti is a double plate modern acrylic house sign. 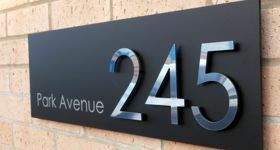 Its ideal size, choice of 6 beautiful shapes and vast design options make this house plaque very popular. 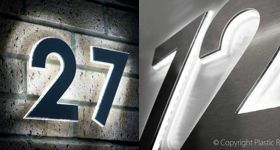 Modern floating house numbers. Large stand off the wall numbers for that prestigious look. 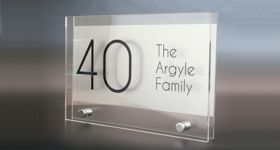 Available in a range of fonts and finishes including brushed aluminium and gloss acrylic. The Sorrento: A unique elegant house plaque that will distinguish your home from the rest. 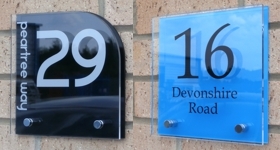 The Sorrento oozes style with its seamless cool Italian matt acrylic, beautifully applied text and floating numbers. 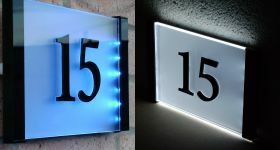 Turn heads with our sleek and individual LED lit floating house numbers. 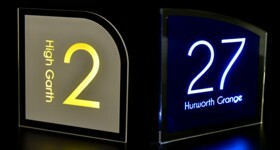 Available in a range of fonts and finishes including brushed aluminium, gloss and satin acrylic. 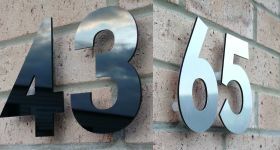 When you save a design or make a purchase you'll be issued a design number. You can view or edit your saved design anytime, just enter your design number in the box below and click Restore.